As we enter another tax season, an estimated eight million low-income single adults without children are about to be hammered deeper into poverty by a federal tax system just as they’re digging their way out.. While federal tax laws generally are designed to protect poor families from falling below the federal poverty level by income and payroll taxes, that’s not so for millions of childless adults. For years, they have been largely excluded from the federal Earned Income Tax Credit, an anti-poverty program designed to offset the income and payroll taxes of struggling low-income workers and their families. Currently, the law sets standard deductions and personal exemptions at levels that guarantee families with children or low-income seniors collecting Social Security aren’t obliged to pay any taxes unless their earnings exceed the federal poverty level. Also, working-poor families with children can qualify for both an EITC and Child Tax Credit that – when taken together – offset their payroll tax liability and supplement their income. But for a 25-year-old unmarried woman who earns poverty-line wages of $12,494 a year working 35 hours a week as a retail clerk, for example, there’s no such protection. While she is likely this year to owe the Internal Revenue Service a total of $1,170 in income taxes and payroll taxes, she will only be eligible for a small EITC of just $184, according to the study by the liberal Center on Budget and Policy Priorities. “In short, federal taxes will drive this woman making poverty-level wages $986 into poverty,” the study asserts. The report suggests that fine-tuning the EITC to address this group would address a patently unfair element of the federal tax code and draw broad support within Congress. “The principle that we shouldn’t tax people into poverty resonates across the political spectrum,” the report states. Indeed, the need to do something to correct the problem is one of the few things on which President Obama and House Speaker Paul Ryan (R-WI) strongly agree. An even more ambitious proposal is being circulated by Sen. Sherrod Brown (D-OH) and Rep. Richard Neal (D-MA). Proponents see an expansion of the EITC program as an important tool for fighting poverty that would also draw millions more into the workforce without the threat of punishing them for their initiative. The EITC for years has been a political football, with Democrats arguing that it is essential to encouraging low-income families to get ahead while Republicans complained that it was enabling nearly half of all Americans to avoid having to pay federal income tax. Now, Republicans including Ryan and Sen. Marco Rubio of Florida, a presidential candidate, view an expanded EITC as a far better alternative to raising the minimum wage or increasing anti-poverty spending. But in order to make that happen this year, Obama and Ryan will have to overcome election year inertia and political gridlock and find a way to cover the estimated $65 billion of additional cost over the coming decade. And with few anticipating any major new tax legislation before a new president and a new Congress take office next January, Ryan will have his work cut out in trying to convince conservative and Tea Party members to add roughly $6 billion a year to the budget. But maybe not. 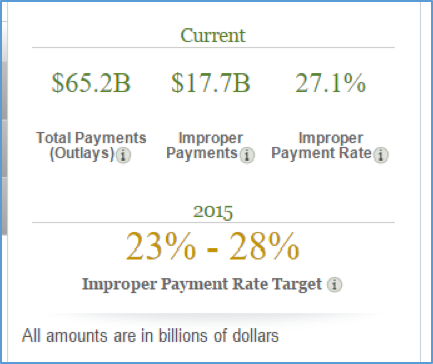 The government reported, “For fiscal year 2015, more than 27 million taxpayers received more than $66 billion in EITC, making the credit one of the largest anti-poverty programs in the country. Unlike other traditional benefit programs, tax filers claim the EITC on their tax returns, without a pre-approval process.” As a result, $17.7 B was issued in improper payments—a 27.1 percent rate. Saving even a third of that would pay most of what’s needed. In the wake of the GOP lawmakers’ annual issues conference in Baltimore, the next step will be to form committee-led task forces that will hold idea forums with Republican members, Strong said Wednesday in an email. The task forces will then develop the specific policy. The Poverty, Opportunity, and Upward Mobility taskforce met for the first time last week, she added, and will continue to meet in the coming weeks as it puts recommendations together. 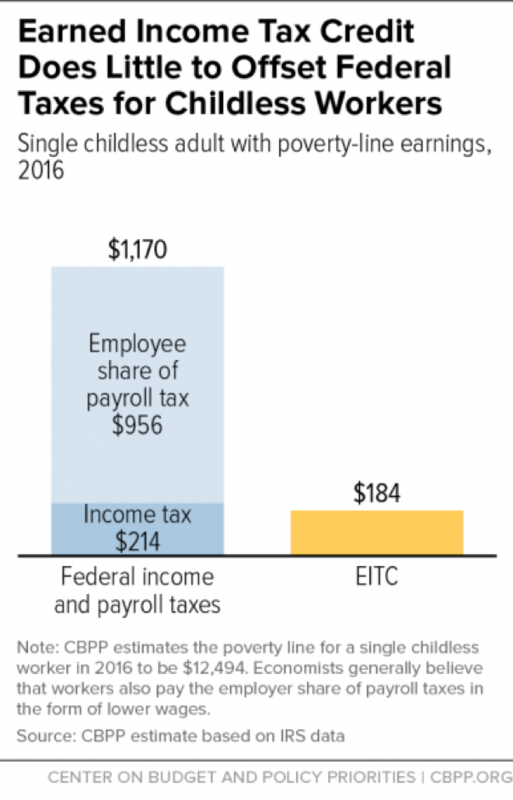 Under the approach favored by Ryan and the president, the EITC would offset a childless adult’s income taxes and share of payroll taxes up to an income of about $11,500 a year. Adults without children who make slightly more than that would still end up being pushed below the federal poverty line. The alternative being promoted by Brown and Neal go a step further by giving someone like the retail sales person an EITC of $1,226 a year, or slightly more than offsetting her total $1,170 federal tax liability, according to the study. Both plans have similar features, including lowering the eligibility age, boosting the maximum credit, and expanding eligibility to include more low-wage childless adults. Can the Democrats Reunite in Time to Stop Trump?